This is not your typical ugly router. For years, “the last mile” earned the title of broadband’s biggest boogeyman. Now that most of us benefit from having a fairly fat pipe to our houses, it’s more like the last 10 feet — Wi-Fi dead spots can drive you crazy. The AmpliFi HD System, one of a new pack of mesh systems that pave the way to our trouble-free Wi-Fi future, solves the problem. With a charming little router and a couple of mesh points, AmpliFi HD makes it possible to get a strong Wi-Fi signal to your basement, your attic or that awkward back bedroom where you can never stream anything. It also eliminates the sort of nerdy pain points typically associated with setting up and managing a home Wi-Fi network. Traditionally, frustrated people who couldn’t get reliable Wi-Fi in certain sections of their homes typically turned to range extenders or higher-powered routers to reach those dead zones. But AmpliFi and its competitors make it easier than ever to get fast internet everywhere you want or need it. That convenience doesn’t necessarily come cheap, but once you’ve experienced rock-solid Wi-Fi throughout your house, you’ll definitely be addicted. Called mesh networks, these systems rebuke yesterday’s ugly Wi-Fi router design and the baffling array of add-ons promising better coverage. Instead, they deliver simple setup, extensive coverage and advanced tools that anybody can use to take the headache out of networking. The AmpliFi HD setup consists of three pieces of hardware: a cute little router shaped like a cube, with a round touchscreen on front and a subtle light on the bottom, and two identical mesh points. 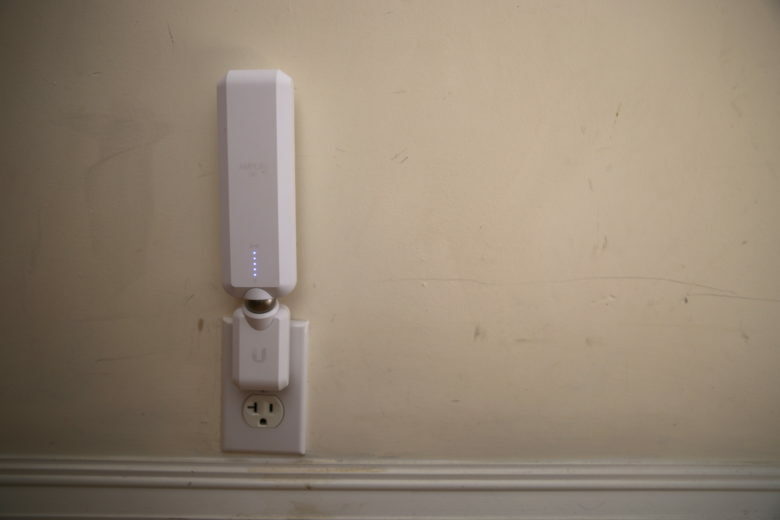 Each matte-white mesh point consists of two components: A power adapter that plugs into a standard electrical outlet, and a long, thin antenna that sits atop the power adapter. A ball joint connects the antenna to the adapter, and a strong magnet holds them in place. The novel design allows the antenna to swivel to optimize signal strength. A demure series of five blue LEDs on the antenna indicate the signal strength — the more that light up, the better. You can waggle and twist the antenna to find your home’s sweet spot, or pop the mesh point out of the electrical outlet and move it to another location. Some people might not like the way AmpliFi’s antennas look or the fact that the power adapters plug directly into the wall rather than using a cord. To me, they look like oversize night lights. I find them endearing — they remind me of a white chocolate Easter bunny with a swiveling head — but others might prefer the tabletop design of competitors like Eero or Google Home. To me, the mesh point design is one of AmpliFi’s key selling points. Since they’re not designed to sit on a table, they work great in a hallway or an inconspicuous corner. Depending on your home’s layout, a hallway might be the absolute best place for a mesh point — and not a great place for a corded, tabletop design. The AmpliFi HD router itself looks nothing like old-school networking gear. You can adjust the brightness of the touchscreen or set it to turn off at a certain hour. Tap the touchscreen to cycle through three different modes: One tracks how much data you’ve downloaded and uploaded over a set time period; a second shows the current speed of your uploads and downloads; a third displays your WAN and router IP addresses. This is all well and good, but I honestly didn’t find myself using the touchscreen because the AmpliFi app delivered all the information I needed. Setup of the AmpliFi HD could barely have been simpler. I plugged the router into my cable modem using a standard Ethernet cable and downloaded the AmpliFi app to my iPhone (it’s also available for Android). The easy-to-use app drove the rest of the setup process, and I got my whole home Wi-Fi network up and running in less than 10 almost totally frustration-free minutes. I encountered only one problem at the outset. A bit of confusion stemmed from imprecise wording of the input fields for the router password and the Wi-Fi password. Like some Apple products, the app proved almost too user-friendly, and I got tripped up for a second because I chose similar phrases for the two passwords. My bad. The next step involved nothing more difficult than plugging in the antennas, one at a time, in areas nearest to the farthest reaches of my house. I live in a three-story house in San Francisco, with the cable drop strategically placed in the middle of the second floor. One antenna in the office attic and one in the back of the second floor blanketed all three levels of my 2,000-square-foot house (and the backyard) in speedy Wi-Fi. AmpliFi HD’s claimed 1,750 Mbps speed far exceeds my maximum bandwidth, and I found it reliably fast. The AmpliFi HD app gives you ready access to networking tools. Beyond facilitating a smooth installation, the AmpliFi app offers simple tools for managing your network and checking its status. You can change passwords, pause internet access for specific devices (great for parents wanting to enforce “quiet time”), and give guests quick and easy Wi-Fi access for specified periods of time. The latter feature works great for anybody who wants to let visitors get online without forcing them to type in a hairy Wi-Fi password, but it would prove particularly useful for small businesses with a steady stream of customers. To give a stranger access, you simply press the guest button on the AmpliFi app, start guest mode, and set a time limit for the guest access to expire. A special guest network pops up and defined number of visitors can log on, no passwords required. It really couldn’t be simpler. Having such a powerful tool available on your smartphone can prove handy in other ways, too. The AmpliFi app helped me solve a problem that had frustrated me off and on for a while. Occasionally, my internet speed would drop to a crawl. I had half-heartedly investigated the problem, but it occurred infrequently, so I hadn’t spent a ton of time searching for the culprit. When my connection ground to a halt on the AmpliFi network, a quick tap of the AmpliFi app’s Resources tab — which lists all devices currently on your network and displays how much data they are sending or receiving — ratted out an old Windows PC. A quick check of the computer’s Task Manager showed iCloud Drive gobbling up the max bandwidth. I shut down iCloud Drive and everything went back to normal. Granted, a bit more savvy sleuthing could have turned up the offending PC, but the AmpliFi app made it exceedingly simple to identify the problem, something my previous Wi-FI setup couldn’t do. Long story short, one of the mesh point power adapters crapped out completely. A series of chat sessions with Ubiquiti’s 24/7 online support, and execution of a couple of simple troubleshooting steps, ended with me getting a return merchandise authorization. The good news is, within a few days, I had a replacement power adapter in hand. I simply popped off the antenna, unplugged the failed power adapter, plugged in the new one and waited a minute or so for the antenna to come back online. Easy-peasy. Even while the second mesh point was down, the Wi-FI in my house worked well. One traditionally problematic room in the back of the house suffered, but I could have repositioned the functioning mesh point had I really needed bulletproof internet access there. Each AmpliFi HD mesh point can be plugged in at a strategic location and maneuvered to fine-tune your network’s reach. As mentioned, home mesh networks cost more than traditional Wi-Fi routers. At $349 list, the AmpliFi HD System comes in at the low end of the price spectrum for this new wave of mesh network Wi-Fi setups. If your house isn’t too big, you could buy a standalone AmpliFi HD router for $149 and take advantage of the app, the powerful throughput and the friendly design. If you find you’ve got dead spots, you can add one or more Amplifi mesh points at $129 a pop. I found the AmpliFi HD system, which is the first consumer product from enterprise networking company Ubiquiti Networks, to be blazing fast and almost completely trouble-free. After using it for months, I’ve rebooted it only once. I can’t say that about any other router I’ve ever used. The app made managing my Wi-Fi network, and checking its status, unbelievably easy. This is the future of Wi-Fi, and I’m loving it. Ubiquiti Networks provided Cult of Mac with a review unit for this article. See Cult of Mac’s reviews policy and check out more stuff we recommend in our Best List reviews.